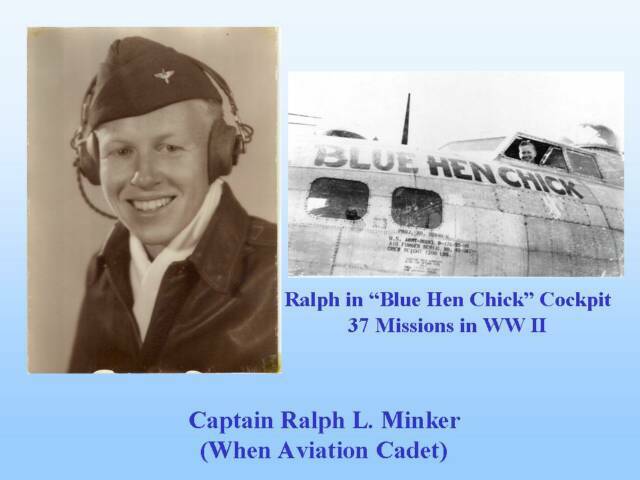 Ralph L. Minker, Jr. was a pilot in the 709th bombardment squadron of the Eighth Air Force in World War II. He was a Methodist minister in the decades that followed. In retirement he is also an aviation historian and author. He dubbed his Boeing B-17G "Blue Hen Chick." At age 20, he was the youngest pilot in his bomber group to chalk up the magic number of missions for eligibility to go home, but he chose to sign up for another tour. By war's end, he had piloted 37 missions over Germany. Despite fierce anti-aircraft fire and strafing, he always brought the "Blue Hen Chick" and her crew back to England. After the war, Capt. Minker, a 1941 graduate of A. I. duPont High School, resumed his studies at Dickinson College, graduating in 1947. Then, following in his fathers footsteps, he went on to the Boston University School of Theology. Ralph Leland Minker, Jr., was ordained a Methodist minister in 1950 and in the decades to follow served eight churches in Delaware and Maryland. He retired in 1990. The Rev. Capt. Minker also preached aviation in appearances at schools, over radio-TV and before other audiences. In 1999, he donated his wartime correspondence (some 800 letters—his own and letters from family and friends) to the Historical Society of Delaware. A book based on this historical treasure is now appearing in bookstores. Its title: "An American Family in World War II." Capt. Minker, highly decorated, says one of his highest honors came in 2003 at Dover Air Force Base when the lettering "Spirit of the Blue Hen" was unveiled on the fuselage of a C-5B Galaxy "in honor of the citizens of Delaware and the men and women of the 709th Bombardment and today's Airlift squadrons." Ralph Minker and wife Sandra live in Reston, Va. Son Skip lives in Portland, Ore.; daughter Janet Himelfarb lives in Bethesda, Md.